openarchives.gr is the prevalent Greek search engine for digital libraries and institutional repository. It is indexing 76 collections from 55 organisations, over 700.000 items. Interoperability of digital libraries is a problem of great complexity but also of immense – and increasing – significance. Huge investments in digitizing legacy cultural heritage material and organising new digital born content can be exploited in more efficient ways through interoperable, open systems. This presentation concerns pragmatic approaches on achieving interoperability in digital libraries and repositories based on relevant experiences of the authors in real-life, large scale, successful use cases such as: (a) the establishment – within the EuropeanaLocal project – of a national aggregator, harvesting digital content (more than 170000 records) from various repositories across the country to incorporate it into Europeana, the single portal / gateway to distributed European cultural heritage resources developed as an initiative of the European Commission, (b) the development and operation of openarchives.gr, a single, unified search engine over Greek digital libraries and repositories that currently indexes metadata from 39 systems (more than 340000 records) and (c) the inclusion of content (roughly 40000 items) from disparate data sources to Pandektis, a thematic repository of cultural heritage and humanities material and Helios – the institutional repository of the National Hellenic Research Foundation. libraries content will be also described. 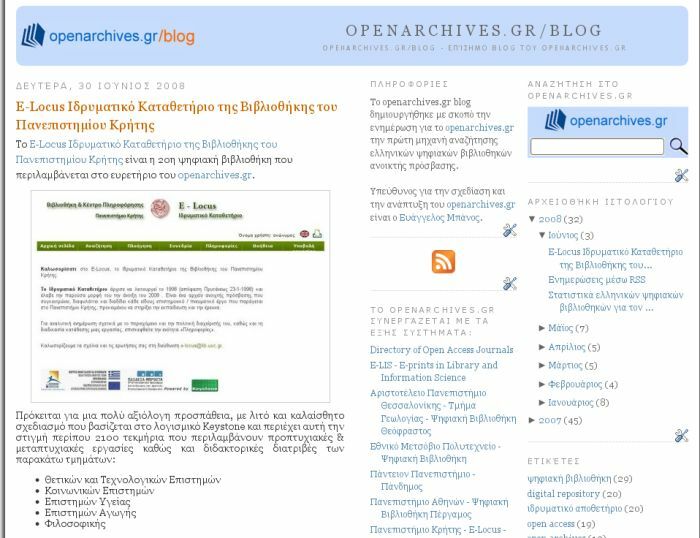 openarchives.blogspot.com is a Greek blogs about hellenic digital libraries and institutional repositories. Additionally, openarchives.blogspot.com tracks the development of openarchives.gr the greek digital libraries search engine. Άρθρο στο περιοδικό Συνεργασία τεύχος 4/2007 του Ινστιτούτου Goethe. Τα ιδρυματικά αποθετήρια ανοικτής πρόσβασης αποτελούν πλέον μια πραγματικότητα για τα ελληνικά ακαδημαϊκά ιδρύματα. Το παρόν άρθρο έχει στόχο να σκιαγραφήσει το τοπίο των ελληνικών ιδρυματικών αποθετηρίων, να δώσει πληροφορίες για τις συλλογές που φιλοξενούν και να περιγράψει τις τεχνολογίες που χρησιμοποιούνται για την υλοποίησή τους.